Below, see how Vitra used Carnegie and Swiss textile manufacturer Création Baumann’s elegant acoustic sheers to absorb distracting noise in their NYC showroom. Sheer bliss in Vitra’s NYC showroom. Photo by Terrance Williams, design by Wundr Studio. Open space plans with natural lighting have become increasingly common in the modern office. However, these spaces lack traditional noise absorbers such as heavy drapes and panels, and as a result acoustic problems have become a major source of user dissatisfaction in today’s workplace (see Steve Johnson’s recent Perspective piece for a closer look at the problem). Carnegie and Swiss textile manufacturer Création Baumann have a solution: acoustical sheers. Offered in three patterns and 34 colorways, and woven with Trevira CS polyester, these cutting-edge textiles reduce noise without sacrificing transparency and access to natural light. We got in touch with Carnegie to find out more. How will the acoustical sheers impact the workplace? The combination of open office planning and the use of hard surfaces (i.e. glass for conference room enclosure) make sound absorption a key issue for the workplace today. Designers and architects need materials to absorb the sound without compromising a modern aesthetic and day lighting in a space. Thanks to superb interaction of weight, porosity and weave technique, coupled with the use of a specially developed foil yarn, the transparent acoustic fabrics achieve a noise reduction coefficient rating up to .65, which matches acoustic panels and heavier textiles for sound absorption. With a light and airy appearance, the sheers enhance the acoustics of an interior while preserving transparency and natural light in the space. Will the product contribute to “new ways of working”? Office design is continually moving to more open and flexible plans. 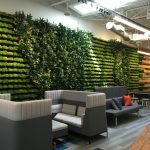 The new normal in office design includes desk sharing, touch down and collaborative spaces, open conference areas, and overall use of drywall to allow for growth and flexibility in space planning. All of these factors lead to noise and a greater need to control acoustics. Improving acoustics in an interior space directly enhances all work functions including concentration, productivity and employees’ sense of well-being. The acoustic sheers supports these efforts in providing transparent acoustical control, which preserves day lighting and enhances a clean modern aesthetic. The sheers can be used at the window, as space dividers or in a glass enclosed conference room. Vitra’s NYC showroom. Photo by Terrance Williams. LOCATION: Vitra Showroom in NYC’s Meatpacking District. CHALLENGE: To create a partition with acoustic properties for designing a “room in a room,” also acting as the backdrop of an exhibition. Employees would hold client and internal meetings in the space created from the curtains while regular showroom activities were taking place, making it important for them to be shielded from the showroom noise while also having privacy for conversation. SOLUTION: A curtain crafted from a blend of sheer Betacoustic for light emission and sound absorption and opaque Lord II for visual privacy. For flexibility and ease of cleaning, the large curtain was subdivided into several parts joined by Velcro straps. To achieve this level of privacy, Vitra installed the acoustical sheers in two locations: surrounding a (video) conferencing area, and also in an area they call the “chair lab,” which is used for chair presentations with customers. Since the chair lab isn’t always in use, Vitra also has the flexibility to move the curtain as needed when they use the lab for other reasons. What was the inspiration behind the sheers? Carnegie’s objective is to design problem-solving textiles that are as beautiful as they are innovative. There is a need in the marketplace for transparent yet sound absorbing textiles for interior spaces. Until now the solution for interior acoustics has been limited to the heavy textiles and dense weaves associated with opera houses, cinemas and conference rooms. These fabrics do not allow day lighting to penetrate interior spaces and they do not reflect a modern aesthetic. The inspiration behind the line of acoustic sheers is to give designers an option for effective noise reduction that is transparent, contemporary, and clean. Création Baumann created the product in autumn of 2012. Carnegie introduced a customized color line of the product spring of 2014. It is a light, modern, airy, transparent textile with exceptionally high sound absorption value that promotes ease and well-being in the workplace. It is equal parts functionality and beauty. Who doesn’t love that? In addition to the airy feel of the acoustic sheers, they are also washable, easy to maintain, and inherently flame-retardant. The sheers are woven from 100 percent Trevira polyester, and are extra wide width (118”), allowing for seamless installs. Correction: The original photos this article were incorrectly identified as Vitra’s NYC showroom. The photos have been updated.